What is the "Fiscal Cliff"? Subject: What is the "Fiscal Cliff"? six × = 36 Required Please enter the correct value. Now that we've explored the dangerous repercussions of the looming Taxmageddon, investors have another important question: What is the "fiscal cliff"? 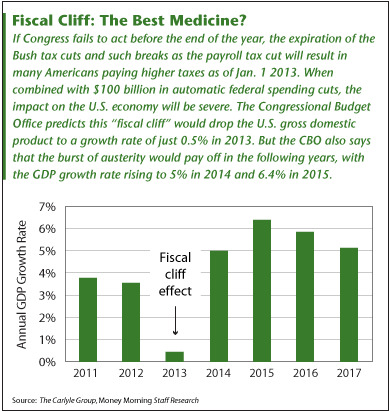 Fiscal cliff anxiety has increased since May 22 when the Congressional Budget Office spread some gloom and doom by citing a potential 2013 recession. As we reach 2012's midpoint, we still have November's presidential election and a ticking clock for Congress and the president to reach an agreement on policy issues by year's end. The likelihood of this doesn't look good. That's why now's the time to prepare for the potential effect from the fiscal cliff. You can thank Federal Reserve ChairmanBen Bernankefor coining the phrase. Fiscal cliff refers to the coinciding action of tax increases and spending cuts that will activate on Jan. 1, 2013 unless Congress and the White House agree and take some action to either delay or change them. Should these two actions marry, you'll watch $7 trillion tagged onto the nation's debt over the next decade, or about $500 billion next year, according to CNN. How will investors be impacted? Tax-wise, the cuts include President George W. Bush's low tax rates from 2001 and 2003, middle class protection from the Alternative Minimum Tax, "temporary" individual and business tax breaks, jobless benefits for the long-term unemployed and a temporary payroll tax expiring on Dec. 31. In addition, $1.2 trillion from spending in federal programs cuts will arrive (see Medicare pay for doctors, no more sundry tax breaks) after a late 2011 Congressional failure to reach an agreement to cut the budget deficit. Lawmakers are expected to push things off until year's end–or at least until after the election. Waiting to do so with this possible lame duck Congress could be "chaos," predicted former Sen. Alan Simpson, R-WY. In support of the "Act Now" camp, Rep. Chris Van Hollen, D-MD, the top Democrat on the Budget Committee, recently said to the Associated Press, "Simply extending all of our current tax and spending policies will produce unsustainable deficits and debt, which will also send the economy into decline. We need to act and we must do so in a balanced way." Even though Bernanke coined the phrase fiscal cliff, don't look to him for help. He has repeatedly asked Congress to take care of the issue. Bernanke recently said, "[I]f no action were to be taken, the size of the fiscal cliff is such that there's I think absolutely no chance that theFederal Reserve… could or would have any ability whatsoever to offset … that effect on the economy. " When we flip our calendars over on January 1 what can we expect to see? Don't panic, nothing will happen overnight; it will be a process. Aside from the expiring tax cuts and federal agency slashing, the CBO sees the U.S. economy contracting at a 1.3% annual rate in the first half of the year from lawmakers' inaction. "Given the pattern of past recessions … such a contraction in output in the first half of 2013 would probably be judged to be a recession," said the CBO. But on the flip side, added growth will return in the year's second half to 2.3%. Chad Stone, chief economist at the Center on Budget and Policy Priorities recently wrote via the Washington Post, "While the limit on spending authority will be imposed at the beginning of the year, the actual reductions in spending will occur over the course of the year and into subsequent fiscal years. Once again, only a fraction of the impact occurs in the first month or so, although expectations of the cutbacks can affect the behavior of government contractors and others in advance of the actual cuts." But what if a full-blown fiscal cliff doesn't happen but instead a short-term deal or few weeks delay occurs. Is it worth it? Sure it would buy time, extend a few tax cuts while postponing spending cuts, but it would just put a Band-Aid on things until the new Congress convenes in 2013. Think back to the 1995-96 shut down with President Clinton and his Republican Congress. The two camps couldn't reach a legislation agreement for the funding of government departments and agencies. Facing strong pressure to reach agreement and get the government moving again, the shutdown only lasted 21 days. At the end of the day, a fiscal cliff isn't likely because of the election, but look for a last-minute compromise. Neither side wants to look like a bad guy in this economy and be remembered as the party who pushed the economy over the proverbial fiscal cliff.